"Big data can lead to information overload. Information overload contributes to stress. So in this age of constant information and real-time data, how do you deal with personal and professional overload? This article suggests that the solution lies in attention management, or better ways to slice and dice your workload. Hopefully with tips like these, we can begin reducing some of the stress in our daily lives." By Don Maruska, Chief Development Officer at Take Charge of Your Talent, and CEO of Don Maruska & Company, Inc.
Summary: Sometimes professional and personal responsibilities can feel like they are spiraling out of control, leading to stress, burnout and negative effects on our overall health. The most commonly discussed aspects of workload management are setting priorities and learning to delegate, but a third commonly overlooked element, attention management, can effectively help you prevent that loss of productivity. 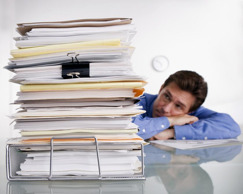 In his blog, Don Maruska offers six tips to effectively manage your workload and increase your overall happiness.